Happy SPRING and Vernal Equinox to you all! Join me today, as I have a very fun craft project to share with you all, to celebrate OSTARA which is our Vernal Equinox sabbat on the wiccan/pagan wheel of the year! This is also just a very general spring project you can do to celebrate the season... you can also make these for Easter as well. They are actually great to leave up on your altar all season long, so no matter what you celebrate, they are seasonally appropriate either way! You can just change the text that you write on them. The materials and ingredients list for this project are minimal, so it's a great quick and easy project to do! That is because you need to let the eggs sit for a few hours, so you can literally set them up, and then go get some other stuff done! Use different colors and get creative with them! You can also use shaving cream or paper towels to get a tie dyed effect! Use pens or markers to decorate them, but just remember that if you do, you can't eat them and they are solely to be used as decoration! Also for more ideas for the season, I have done a book review on Llewellyn's Sabbat Essentials Ostara: Rituals, Recipes & Lore for the Spring Equinox, which you can view in this video here!
" Celebrate the season of returning sunlight and the bursting forth of the birds, bees, and trees. Ostara - also known as the Spring Equinox - is a time of renewal, a time to plant seeds as the earth once again comes to life. This guide to the history and modern celebrations of Ostara shows you how to perform rituals and work magic to renew your power and passion for living and growing." Also here are some of the links that I talk about within the video! * I am not affiliated with Llewellyn Publishing or Amazon in any way. I'm simply just loving this book and relaying the information if you are interested! Follow me on instagram for daily posts, updates, stories, polls, tarot insights, and more! Are you planning on celebrating Ostara? Tell me how in the comments! I'd love to hear from you! Comments? Questions? Suggestions? Video Requests? I made these boards on Polyvore probably about 5 years ago. I was obsessed with that site. I would use it to pretty much mood board all of my favorite movies and books, creating scenes and character studies. I made these boards for my all time favorite movie PRACTICAL MAGIC. I made a board for The Aunts, Sally, Jillian, The Little Owens, Officer Gary Hallet, and Jimmy Angelove. Unfortunately, the site closed down because they sold out to some lame company, and everyone who didn't save their boards had lost em. 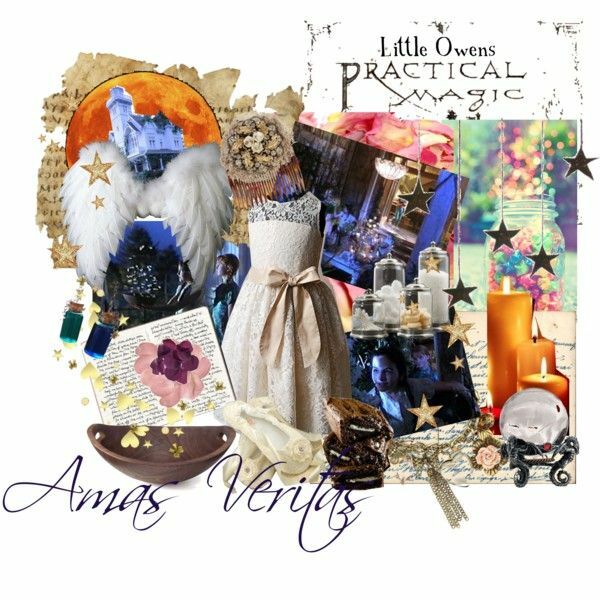 I WOULD have lost these boards, but luckily... some other crazed Practical Magic fan must have found my boards, and they pinned them to their Pinterest Page!!! What a RELIEF! So, THANK YOU to the rando who pinned my boards, so I didn't lose them because of you!! 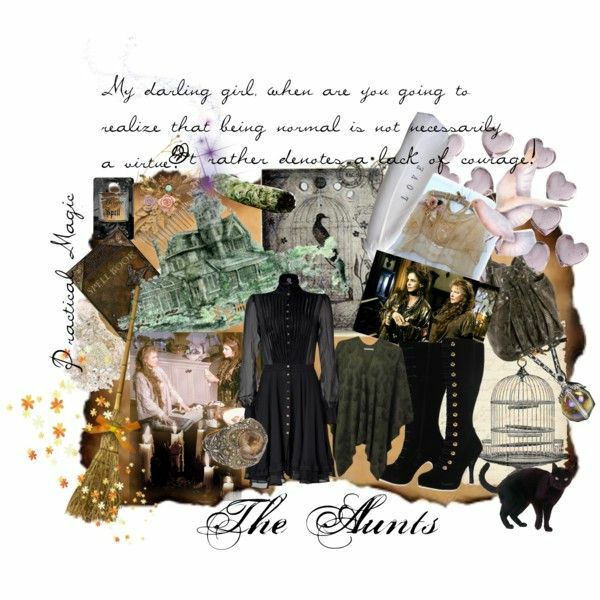 <3 I LOVE these boards so much :-) Anyway, I totally miss Polyvore and the fun paperdollesque feel they had... If anyone can find another site like it, PLEASE LET ME KNOW! Happy SPRING and Vernal Equinox to you all! Join me today, as I have a very lovely book to share with you all, in preparation for OSTARA which is our Vernal Equinox sabbat on the wiccan/pagan wheel of the year! The magickal book that I am covering today is called Llewellyn's Sabbat Essentials Ostara: Rituals, Recipes & Lore for the Spring Equinox. In this video I will review the different sections and subjects that the book has to offer: Rituals, recipes, lore, spells, divination, crafts, correspondences, invocations, prayers, and meditations. I will also show you a beautiful diagram of the wheel and give you some context about its position on the wheel in relation to the other sabbats throughout the year. I will also distinguish for you, the difference of sabbats between the northern and southern hemispheres. In this video we will chat about some of the things you can do to prep your home for the warmer months to come, as well as some of the activities you can do, involving lots of eggs! I will also touch on mysterious theories of the spring goddess known as Eostre, and some of the other dieties you can work with on this Ostara. You can purchase this book on Amazon here for $11.69! I know I haven't been too present on my Youtube channel as of lately, so I just wanted to pop on here an explain why! A lot of good stuff has being going on in my life, however it has kind of thrown stuff out of wack with all of my creative endeavors. I am in a new home, so I am currently still trying to get settled. All of my creative stuff for Bohemian Magic Studios is still kind of all over the place, so please bear with me while I get my home office all set up. I also need to figure out a lighting situation for my kitchen videos. Anymore, check out my vid and I'll explain it all :-) I've missed you so, so I really want to get back to making videos for you all! If you have any ideas for new videos, let me know in the comments down below! In the meantime, check out my other BOOK REVIEWS on a playlist here! Watch my complete Witchin’ Kitchen Playlist HERE! SIGNUP FOR MY MAILING LIST FOR UPDATES! Now without further adieu, here is a recipe/bath and body craft project I tried with some cute empty ball ornaments that I found at the dollar store (2 for $1). The recipe is pretty straight forward, it only uses a few basic ingredients that you can find in your home pantry, as well as some doTerra Essential Oils. In this video, I will be showing you how to make 2 different scrubs! Also be sure to include a small jar of extra virgin coconut oil along with your gift, so your recipient can have their own fun concocting their very own special sugar scrub themselves! I hope you are able to try this recipe for this Yuletide season, especially as gifts for your loved ones! I love making homemade Bath and Body products as gifts when I am on a budget! Have you tried this before!?! Do you do things differently? ​I’d love to know your experiences making these cute sugar scrub ornaments, in the comments below! Find more of my favorite recipes and boards for the Sabbats & Esbats on my pinterest page HERE: FOLLOW ME ON PINTEREST HERE! Now without further adieu, here is a Strawberry Fruit Leather recipe I tried with the strawberries we had picked last strawberry moon. The recipe is pretty straight forward, it only uses 3 ingredients! I would like to thank FIFTEEN SPATULAS for the recipe, it is one of the recipes I have pinned to my LITHA pinterest boards. You’ll also need a blender, a baking sheet and some parchment paper. Now you’ll notice in the video that I had first attempted this recipe with all of the strawberries that I had, which was definitely more than one cup. After noticing that my mixture would not condense down, I realized that I did have to follow this recipe per 1 cup of strawberries. So I ended up making each sheet in one cup increments, to achieve the best results. Have you tried this before!?! Do you do things differently? I’d love to know your experiences making fruit leather, in the comments below! Welcome Back to another magickal vlog at Mad Lavender Farm! My friend Jenn joins Avi and I for some goat yoga, courtesy of Wildflower SUP & Yoga. We had some much laughing and coddling baby goats. goods made with the lavender from her whimsical farm. There’s just something so magickal about this place, we just love visiting whenever we can. As we headed home my allergies started acting up so it was time for a cup of tea. Join me as I drink my tea and review some of the yummy products we bought from the farm. We got a Lavender Mint Vanilla candle and some Black Amber and Lavender Soap. Check out some of the links below for more info on these products and future farm, and Wildflower Yoga events! The Sierra Club is a national, member-supported environment organization, which seeks to influence public policy in both Washington and the state capitals through public education and grass-roots political action. ​Email me with Comments or Questions! If you suffer from Spring allergies, then this is the perfect remedy for you! I have ordered these really adorable roller bottles off of Amazon and then used 3 of the most common essential oils (lemon, lavender, and peppermint) to create my own roller bottles, which are great in remedying allergies and other respiratory/sinus issues. DoTERRA actually refers to these 3 combined oils as their Tri-ease blend. You can purchase these supplements HERE! You can also purchase the Tri-ease oils in their single oil form if you would like to be more creative with them and make your own roller bottle blends, or for straight application. Roller Bottle Kit with Funnel (12 Bottles) UPDATE: This item is currently out of stock, but the seller has some other great options that you can check out! If you are interested in purchasing any of the products you saw in today’s video or interested in a doTERRA year membership so you can save big bucks on your oils through wholesale pricing (25% off retail price all year long!) and even have the opportunity to make some extra income sharing these magickal oils, email me for that as well! ​SIGNUP FOR MY MAILING LIST! Thanks have a magickal day! So I wanted to do this video for anyone else who is just starting out with the business aspect of sharing oils and trying to make some commission, whether it’s to supplement income, or even replace the 9-5 grind. These tricks might not be so new to some of you, you may have even implemented some of these ideas before, but I’m pretty new to the game and still learning certain strategies to help my business grow without me going broke and investing more than I’m getting back to start off. 1. How to meet my 100 PV in my LRP (Loyalty Rewards Points) Cart so that I can collect commissions, without digging into my own pocket. 2. How to get the FREE Product of the Month, without digging out of my own pocket to process an LRP order. 3. How to get people purchasing through your LRP cart, to pay you for the oils on time, so that you can ensure your order is processed on time. ​4. What happens to your account when it expires, and what happens when you re-enroll. 5. Explanation of the fast start bonus. 6. What to do with your cart to set it up for the following month, after your current LRP month order is processed. 7. How to bag the products in a cute and effective way for people who are purchasing oils from you through your LRP cart. 8. How to get repeat purchasers or even new new-enrollments through the use of product samples. Thanks have a wonderful day!